road credentials, the Continental GT3-R is a highly exclusive and unique interpretation of performance-focussed luxury, limited to just 300 examples. All 300 examples of the Continental GT3-R will be hand-built in Crewe and finished in Bentley's Motorsport division. Bentley engineers have developed a retuned version of Bentley's race-proven, high performance 4.0-litre twin-turbo V8 for this new two-seater GT. Developing 580 ps (572 bhp/426 kW) and 700 Nm of torque, together with a 100 kg weight reduction and shorter gearing, the Continental GT3-R is the fastest-accelerating Bentley ever. Capable of reaching 60 mph from a standstill in just 3.6 seconds (0-100 km/h in 3.8 secs), the GT3-R is a Grand Tourer with the performance of a racer. Complementing the revised powertrain is a further development of Bentley's renowned all-wheel drive system, which now features torque vectoring for the first time. Together with modified Electronic Stability Control (ESC) and a chassis tune optimised for outright cornering ability, the Continental GT3 R is the most dynamic, responsive and involving Bentley road car ever. "The experience of driving a Continental GT3-R is awe-inspiring, and takes the dynamic abilities of our Grand Tourer to new heights. We were inspired to create something extremely special for the road by the performance of our Continental GT3. It is a celebration of the Bentley passion for building outstanding drivers' cars. To be a true Bentley, the GT3-R had to be the most luxurious track-inspired Grand Tourer ever, and this car pushes our trademark combination of luxury and performance to a new level," said Wolfgang Durheimer, Chairman and Chief Executive of Bentley Motors. For the GT3-R, Bentley's powertrain division set about developing a special combination of engine, driveline and exhaust to create an evocative, powerful yet efficient system. Bentley's popular and widely acclaimed 4.0-litre twin turbo V8 engine, now race proven by the Continental GT3, has been fitted with precision-honed high-boost turbochargers and developed with new engine control software to liberate 580 PS at 6,000 rpm and 700 Nm of torque from 1,700 rpm. This increased power is fed through the Continental's eight-speed ZF automatic gearbox, now with shorter output gearing to enhance acceleration, to Bentley's renowned all-wheel drive system. For the first time for a Bentley, the drivetrain has the ability to control the torque at each of the rear wheels through the use of torque vectoring. Recalibrated control software means that Drive and Sport modes are moved further apart, each with different characteristics and with Sport mode designed for more spirited driving. Maximum driver control is provided by completely recalibrated paddle shift functionality. A soundtrack appropriate to the new levels of performance is provided by an all-new titanium exhaust, which not only provides a weight saving of 7 kg but also has allowed Bentley's acoustic engineers to give the GT3-R a unique baritone roar. To provide a dynamic capability unmatched in the Grand Touring sector, the GT3-R receives a chassis system focussed on performance whilst retaining a cossetting level of refinement for everyday use. Air springs and dampers use a development of the sports-tuned setup from the Continental V8 S, already recognised as the best-handling Bentley ever, while lightweight forged 21-inch wheels and high-grip Pirelli tyres deploy the torque-vectored power output of the engine. Deceleration is via Bentley's record-holding Carbon Silicon Carbide (CSiC) braking system. 420 mm front discs are slowed by 8-piston calipers finished in eye-catching green paint, while 356 mm discs are fitted to the rear axle. With the ability to absorb up to 10 megajoules of energy (enough to power a family home for six hours) in a single stop yet remain fade resistant, Bentley's CSiC brakes are an engineering masterpiece in their own right. "We wanted to develop our powertrain and chassis systems further than ever before for the GT3-R project. The result is a Continental GT that is more dynamic than ever, with a torque vectoring system that neutralises understeer and a chassis tune that is both direct and forgiving. We've differentiated the Drive and Sport modes further to give the driver a choice between a relaxed and refined Grand Tourer and a sharp supercar with instant responses. The reflexes of the car are matched by the throttle response from our redeveloped V8 engine, and the new turbochargers eliminate turbo lag. Bentleys are rewarding drivers' cars - but dynamically, the GT3-R is our finest hour yet," said Rolf Frech, Bentley's Member of the Board for Engineering. The two-seat configuration includes a pair of new bespoke sporting seats with additional side support through deeper bolsters, including newly designed foam layers for comfort and finished in Beluga black leather with diamond-quilted Alcantara. This exquisite material is also hand-trimmed to the steering wheel and gear shifter, while the centre console and fascia panels are handcrafted in carbon fibre. Carbon fibre is also used to create beautifully sculpted door casings that also include diamond-quilted Alcantara inner panels. In place of the rear seats is a new uniquely trimmed rear cabin, complete with a carbon fibre surround and finished in leather and Alcantara. For the exterior of the GT3-R, Bentley's Design team was tasked with creating a more purposeful stance than ever before. A new front splitter provides an assertive look to the front of the car, balanced by a new fixed rear wing fitted to the boot lid – both finished in exquisite carbon fibre. The bonnet incorporates two vents to improve the cooling capacity of the powertrain system for repeated accelerations while also invoking the shape of the Continental GT3 racer in a styling element where form follows function. 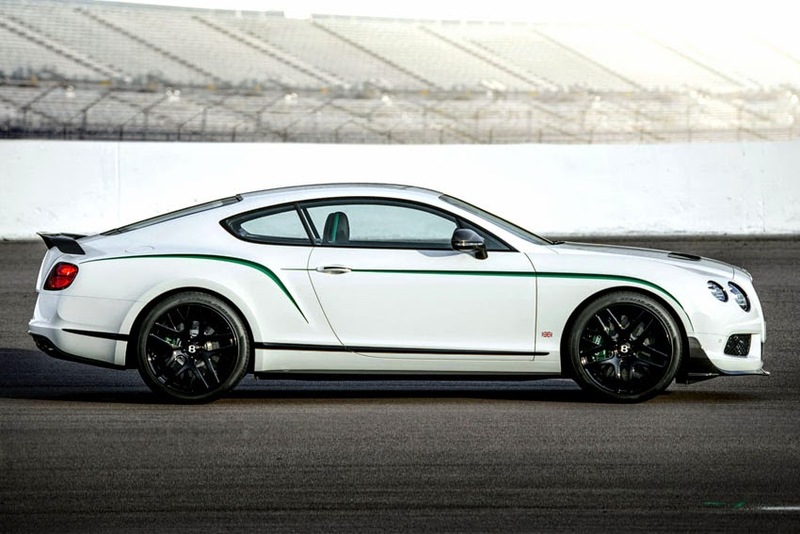 The gloss carbon fibre contrasts with the Glacier White paint that all 300 cars will be finished in, and the inspiration of the Continental GT3 race car is highlighted by the use of two-tone green graphics that trace the two power lines to the side profile of the car - one leading backwards from the front wheel, the other tracing the shape of the Continental GT’s iconic rear haunch. Further inspiration from the Continental GT3 is reflected in the finishing touches to the exterior - the headlamp bezels, matrix grille, window surrounds and bumper strips - all finished in stylish gloss black. The visual appeal of the Continental GT3-R is completed by an all-new lightweight 21-inch wheel, machine-forged from high-strength alloy and finished in gloss black.